Meet our new Director of Facilities and Production! I am thrilled to be joining the Theatre Centre team. This young lady from Timmins, Ontario couldn’t have predicted what a journey she embarked on when she decided theatre was her way of life. This intro is going to be short and sweet…just like me! I started my theatre adventures when I was in high school, playing with the local French and English theatre companies, with the dream of being an actor. Having moved to the big city of Ottawa, in 2005, I graduated from the Algonquin College Theatre Arts Program. I entered the program as an actor and left 2 years later as a stage manager. Shortly after, I launched into my apprenticeship working with the Great Canadian Theatre Company, followed by my introduction to the Toronto theatre scene with Factory Theatre. For about 2 years, I was living & working between Toronto and Ottawa, with a significant move to the bigger city of Toronto in 2009. This year will mark my 10th in Toronto. My production managing career began much earlier than anticipated when I took on the role with Théâtre français de Toronto. Working in my native tongue for the last 5 years has been a blessing and honour. 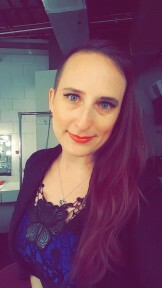 I’ve since had the privilege to work with other companies and festivals; Theatre Gargantua, Luminato, Classic Theatre Festival, Canadian Stage, Tarragon and most recently Progress Festival. I would eat fries and gravy every day, if my heart could handle it. I am terrified of flying but I love to travel. I listen to and read way too much true crime. My family consists of my cat Mittsy, my partner Samy and my stuffed polar bear Cubez.